Lettered above: KEY TO THE ENGRAVING OF THE DISTINGUISHED MEN OF SCIENCE OF GREAT BRITAIN 1807-8, and below: Printed by T. Brooker/LONDON: PUBLISHED MAY 20th 1862, BY MESSRS WALKER & SON, 64 MARGARET STREET. CAVENDISH SQ, W.
For the following resumé I am indebted to Dr Clow's pioneering examination of the subject in Annals of Science, September 1956. 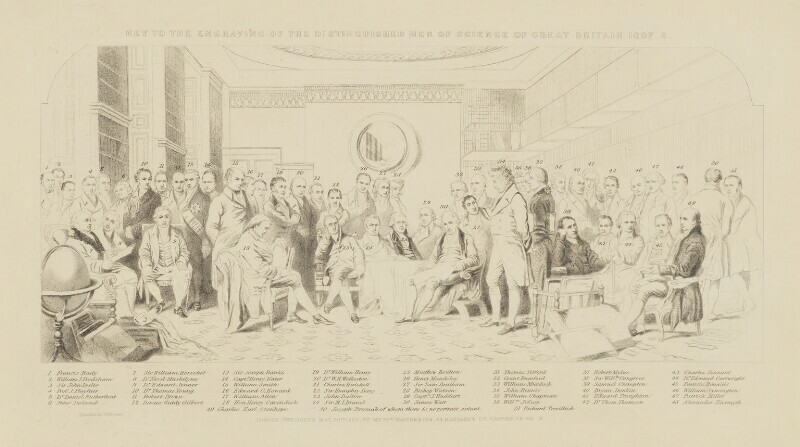 The Drawing of the "Distinguished Men of Science living in 1808" was the last work my Father was engaged on. Sir John Gilbert designed the grouping & general effect. J. F. Skill then worked on the drawing & my Father finished it, the greatest care was taken in getting the likenesses correct & every available means employed so that the likenesses remained almost standards. My Father then engraved the plate with the assistance of George Zobel. The idea of the work was his own conception & altogether occupied six years in carrying out. Walker and Gilbert had already combined to produce the engraving of 'The Aberdeen Cabinet Deciding upon the Expedition to the Crimea in 1854', published in 1857, and this new venture was begun at about that time. Dr Clow suggests that a further incentive may have been the publication in 1845-6 of Lord Brougham's essay, Lives of Men of Letters and Science in the Time of George III. Gilbert's original sketches (NPG 1383a) with their revealing titles disclose its evolution from little more than a jotting to the final engraving - six years during which, although the basic design remained static, several changes were made in the choice of figures to be included. The Swedish chemist Berzilius was replaced by Dundonald who in turn gave way to William Smith. Peel was replaced by Ronalds, Beaufort and later Fourdrinier were removed, and four newcomers added: Chapman, Frodsham, Troughton and Watson. The final selection demonstrates the Victorian definition of 'Men of Science' as being in fact 'Men of Technology'. The focal point is James Watt and a group of engineers surrounded by chemists and physicists. The Portraits are in every possible case taken from Originals of the greatest merit, and Mr Walker thankfully acknowledges the aid extended to him by many private Gentlemen, especially Dr William Sharpey (Secretary of the Royal Society) and Mr Woodcroft (Superintendent of the Patent Office) by whom every facility has been offered for making copies from many unique originals in the Patent Museum and Portrait Gallery formed by him. Except for the daguerreotype of Donkin and a photograph of Ronalds, probably by Walker himself, they were mostly engravings from paintings, drawings or miniatures, which were then copied or adapted by Frederick Skill and arranged in the groups decided on by Gilbert. In 1864-5 William Walker and his two sons were considering a companion picture, 'Men of Science Living in 1846-7', many of the portraits to be based on photographs taken in their own studio in Margaret Street: 'there is a real advantage in doing this because I take several views of the countenance in the right light and shade best suited for my purpose of grouping ...'. Letters in the Royal Society library intimate that Sir John Herschel was to be the central figure of this group; an appointment was made at the studio for 26 July 1865 (Herschel Letters, 18, pp 18-20). Walker died in 1867 and the project was never completed. The following scientists, listed alphabetically, are represented in either the drawings or the engraving. Those marked with an asterisk [*] are included in the main Catalogue. The sources of the portraits are given in William Walker's Memoirs. Chemist. Portrait based on an oil by Madame M. Astronomer Romilly, engraved Darton (see Richard Ormond, National Portrait Gallery: Early Victorian Portraits, 1973, p 538). President of the Royal Society 1778-1820. Freely adapted from an oil by Thomas Phillips in the Royal Society. Banks's face is slightly disfigured by splashes of wash (see forthcoming NPG Catalogue of Portraits 1760-90). Hydrographer. He appears in Gilbert's preliminary drawing only. Naval architect. Portrait based on a miniature by Murphy (see forthcoming NPG Catalogue of Portraits 1760-90). Swedish chemist. He appears in Gilbert's preliminary drawing only. Engineer. Portrait based on an oil by Beechey, engraved Cardon (see forthcoming NPG Catalogue of Portraits 1760-90). Botanist. Portrait based on an oil by H. W. Pickersgill engraved Fox (see Richard Ormond, National Portrait Gallery: Early Victorian Portraits, 1973, p 66). Physicist. Portrait based on a drawing by Tomlinson (see forthcoming NPG Catalogue of Portraits 1760-90). Civil engineer. Portrait based on a drawing perhaps by John Opie. He appears in the engraving only. Optician. Based on an oil by John Hoppner, engraved Thomson (see forthcoming NPG Catalogue of Portraits 1760-90). Chemist. He appears in the drawing only, not the engraving. Paper maker. He appears in the drawing only, not the engraving. Chronometer maker. He appears in the engraving only, not the drawing. Astronomer. Portrait based on a pastel by John Russell (see forthcoming NPG Catalogue of Portraits 1760-90). Pioneer of steam navigation. Portrait based on an oil by Alexander Nasmyth (see forthcoming NPG Catalogue of Portraits 1760-90). Architect and civil engineer. Portrait based on a miniature (see forthcoming NPG Catalogue of Portraits 1760-90). Calico printer and cotton spinner; father of the Prime Minister. He appears in Gilbert's preliminary drawing only. Electrician. Portrait based on a photograph by William Walker (see Richard Ormond, National Portrait Gallery: Early Victorian Portraits, 1973, p 399). Geologist. He appears in the engraving only. Instrument maker and inventor; he appears in the engraving only. Chemist. Portrait based on an oil by George Romney, engraved Jones and others (see forthcoming NPG Catalogue of Portraits 1760-90); he appears in the engraving only. Engineer. The central figure of the group, portrait based on Beechey and Chantrey (see forthcoming NPG Catalogue of Portraits 1760-90). Archibald Clow, 'A Re-Examination of William Walker's "Distinguished Men of Science"’ in Annals of Science, II-3, September 1956, pp 183-93 and 5 plates. Lionel Cust, The National Portrait Gallery, 1902, II, pp 110-13. William Walker junior, Memoirs of the Distinguished Men of Science of Great Britain Living in the Years 1807-8, 1862. Engraved key to NPG 1075a, containing 51 figures. William & Elizabeth Walker and bought from their son William Walker, November 1896. 'The Heritage from Newton and Linnaeus', Stockholm, 1962 (210).